Happiness is....materials for creativity. 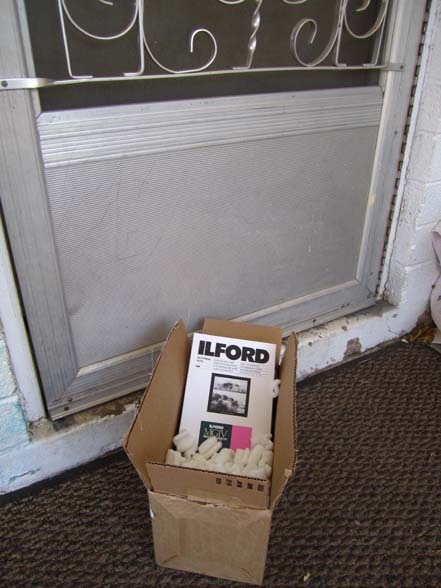 My brand-new box of photographic paper arrived the other day. I use this light-sensitive paper as negatives for my pinhole cameras. I have not had the pleasure of time or inspiration to pinhole this past year or so- busy with other concerns, obligations, responsibilities, and busyness of my children's education. You know- a full schedule- the bain of creativity! But, we will be traveling soon- to places some of us have never been- and places I have never pinholed before. Different landscapes await, so I will cut my paper to size, pack my camera bag, and anticipate some pinholing fun.